I know that the premise of my blog was marathon prep, and since the marathon is complete, you’re probably not interested in more posts. But, I do have some post-marathon updates that I feel compelled to share. Honestly, I don’t know if I’ll ever do another marathon. But, I do know that getting ready for the marathon got me in pretty good shape and I don’t want all that to go to waste, so I am trying to keep legit running in my schedule. Janet feels the same way. So, we signed up for a 10 mile race in southern Maine (The Mid-Winter Classic in Cape Elizabeth) so that we would have a reason to go out in the cold and stay in shape but not feel compelled to run for hours and hours and hours all in the same day as if we were training for a marathon. But, 10 miles is a big enough distance that I can’t blow it off and therefore have to keep regular running in my routine. This is a particularly busy time at work *and* I have some other commitments that are taking a huge amount of time, so I have to fit the running in when I can. I’m telling you this to justify why I was running outside this morning in single digit temperatures. But, when I got up this morning, it was 1.2 degrees. ONE POINT TWO. 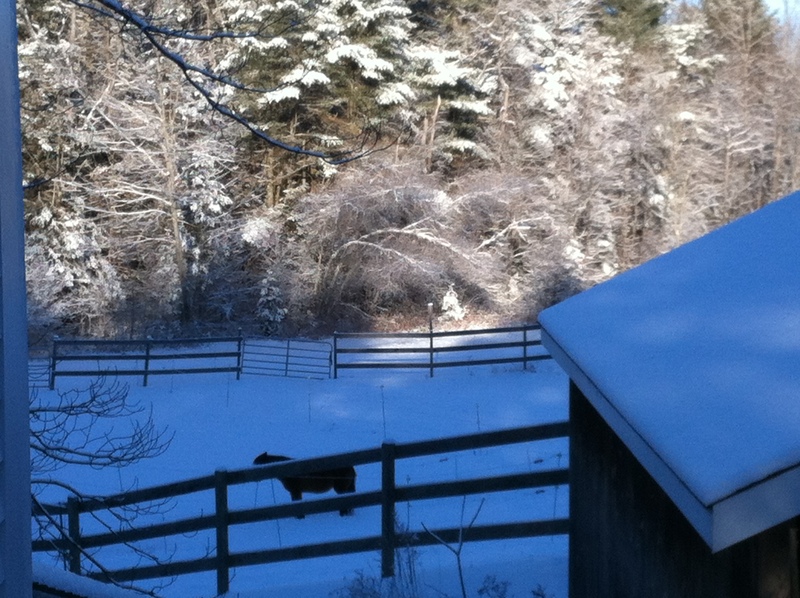 So, I did barn chores first, hoping it would warm up a bit before I had to go run. It did warm up. It warmed up to 2. 7 degrees. I bundled up and started off. The first .5 mile was really, really cold. Then my body warmed up and I actually started to sweat, unzipped my jacket just a little. Mile 2.5, the front of my hands, front of my thighs, and my chin were really cold. It was cold enough that my eyes were watering for most of the run, and by mile 3, I had ice on my upper and lower eyelashes. So much ice, in fact, that I could hear my ice-ball-lashes “clicking” when I would blink. The ice was too stuck to just wipe off my lashes as I was running. When I got home, I had to cup my bare hands over my eyes to warm up enough to help the ice balls slide off. THAT is Winter Crazyland, my friends. That is what it looks like. When I got back home, I checked the temperature, and sure enough, it was still pretty cold. 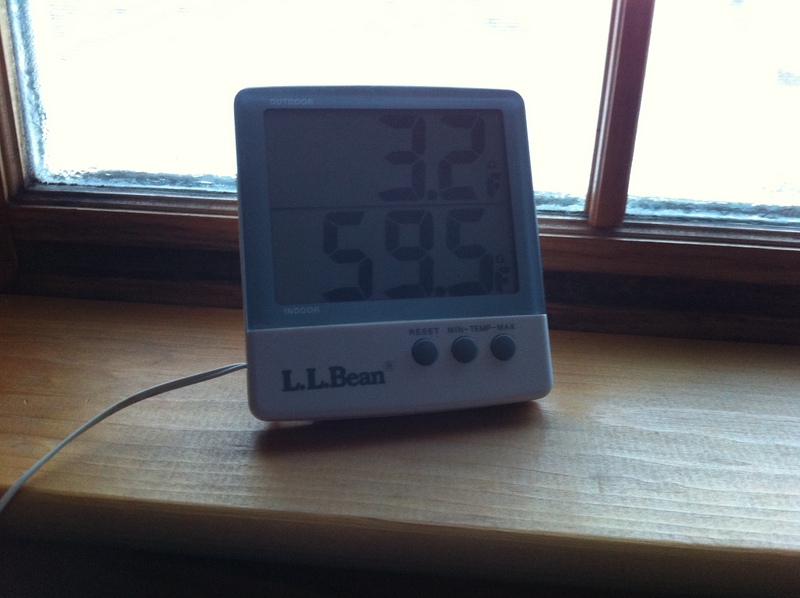 A mere 3.2 degrees outside and only 59.5 inside. Janet and I have brainwashed 3 other women to run with us on Saturday morning, distances between 5-8 miles depending on who wants to turn off where, in very cold temps. Can’t wait to welcome them into CrazyLand.